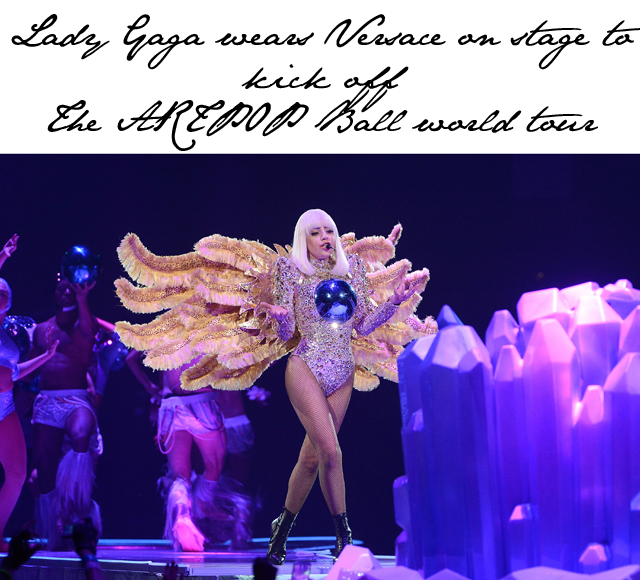 Lady Gaga stepped onto the stage to kick off The ARTPOP Ball World Tour last night in Ft. Lauderdale, FL. The superstar not only debuted a whole new show, she also gave a sneak peek at a whole new wardrobe. For anyone that has ever seen a Lady Gaga concert, you'll know that the outfits are just as much entertainment as the songs themselves. So the big moment arrives and Gaga takes to the stage. And what do we find? Well, only a designer runway moment. Gaga and her dancers all stepped out in a series of looks from none other than Versace. Some stars have all the luck. From a sparkle-city bodysuit, with matching wings, to a dress that made Gaga look like she was preparing for a white wedding, these were definitely some darling looks that both opened and closed the show.